Because who can imagine being interested in actual people? Listening to Meryl Streep impersonate the persnickety, dying-quail voice of Eleanor Roosevelt in Ken Burns’ “The Roosevelts: An Intimate History,” you get the sense that this is the role she’s been waiting to play since she hatched fully formed from a green alien pod at Yale. The production would be about twenty percent shorter absent her painstakingly overdone, sloowwwwly enunciated pronouncements regarding poor people, dams, etc. “Meryl,” you want to say, “spit it out already so we can get to George Will’s next howl-inducing metaphor concerning the American spirit.” A few episodes in, my interest was maintained by one topic only: Eleanor’s connection to lesbianism. (You can’t help but wonder why all of her gal pals favor slacks.) But Burns and co. are too square, too reverential to address it. I’d love to see someone make an historical-figure travesty along the lines of “Abraham Lincoln: Vampire Hunter” in which Eleanor, transposed to the swinging ’60s, dresses like Monica Vitti in “Modesty Blaise” and engages in hot lesbo action with a similarly transposed Mamie Eisenhower. Where “intimate histories” are concerned, I think dykes are more germane than dams. This entry was posted in History, Movies and tagged documentaries, Eleanor Roosevelt, Film, Ken Burns, Meryl Streep, movies, PBS. Bookmark the permalink. I think her pod opened at Vassar. Which is even worse. 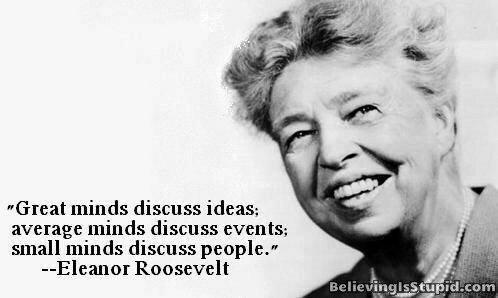 Eleanor Roosevelt worship is one of the saddest things about the Left. But it goes to show you that pushing the Progressive envelope was the route to fame and hagiography even in the 1930s. Progressives have owned the Narrative for a very long time now. OT, but going back to your year-end film picks. I recently watched both “Tomorrowland” and “Clouds of Sils Maria” and very much enjoyed them both, especially the second. I might have gotten to them eventually otherwise, but your picks drove me to action. I appreciate it. I agree the Roosevelt worship is way overdone…. but I actually enjoyed the show. Came out of it feeling more sympathetic towards Franklin (surprised!) and much less sympathetic towards Eleanor.